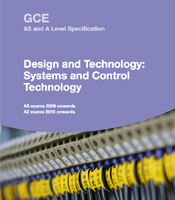 We are not developing a new A-level Systems and Control Technology qualification due to government changes to A-levels. The last exams for students taking the current qualification will be in the June 2018 series, with a final re-sit opportunity in June 2019. As an alternative, you may like to consider our Level 3 Tech-level qualifications in Engineering. Find out more about these changes and which qualifications we are planning to offer in the future. You can also contact the customer support team on the details shown below. This specification encourages students to take a broad view of Design and Technology, to develop their capacity to design and make products and to appreciate the complex relations between Design, materials, manufacture and marketing. It is helpful, but not necessary, for candidates to have studied a GCSE Design and Technology course before commencing work on this specification. The course will provide students with the opportunity to develop a range of investigative, research, analytical, modelling, designing and making skills that can be applied when solving problems. The emphasis of the course is on the application of knowledge. It is intended that students will have the opportunity to learn through practical activities by producing multiple solutions to problems.